A good way to gauge demand for hardware is to follow the behaviour of retailers. It very much varies by region at the moment with Nintendo Switch, but it seems the system is pretty hot right now in the US. As always, when there's a popular product and dollars to be made, GameStop is ready to relieve you of your cash. According to Forbes a 'Starter Bundle One' can also be ordered in stores for $509.99, which includes the system, Breath of the Wild and the Expansion Pass, Super Bomberman R and extra Gray Joy-Con (left and right). In both cases these bundles seem to be a mark-up on the core value of the products. We've seen retailers do this before, of course, and the argument can be made that it's capitalism at work and we should just deal with it. From Nintendo's perspective it's surely delighted at the record-setting pace of launch sales, though now needs to scramble to top up stock to help ensure that consumers can find and buy the system at its recommended price. As we've said, availability varies per region, and hopefully Nintendo will get on top of stock shortages; ideally it'll do so sooner than mid-April, too. @Joeynator3000 I would love to see an HD Remake or sequel on Switch. A benefit of region free is that low selling regions can have their stock shifted to high selling regions, like what they did regarding Amiibo. @Joeynator3000 : I miss Wario anything. The 3DS still doesn't have a Wario game!!!!!!! I understand his absence on Wii U (not counting Game & Wario) due to the low install base and the fact that Wario is not a monster-selling IP, but… nothing on 3DS? They'd better be working on Wario Switch behind the scenes, though Nintendo may not consider the brand as big a priority considering how badly Game & Wario must have flopped on Wii U (and they only have themselves to blame, despite how good some of the modes were). @Joeynator3000 all the more reason the switch really needs to bring a virtual console with GameCube games to the table. 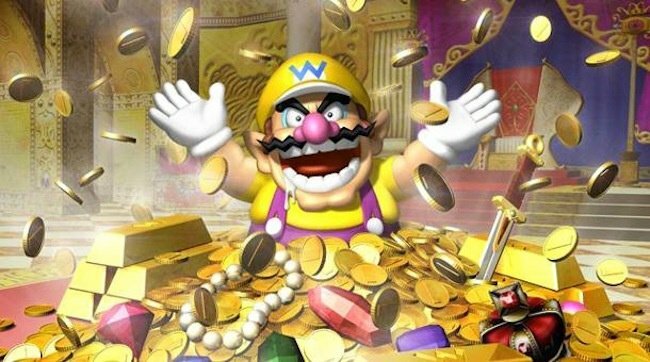 @sillygostly the issue is of Nintendo's platforming franchises, Wario sells the worst. And your platforming teams will be put to work on Mario, then Kirby, then Yoshi, then Donkey Kong, then you hit Wario. While it would have been nice to have a sequel to Wario Land Shake it on either Wii U or 3ds, it's not like either of those haven't been bringing the platformers. If anything the Wii U's weak point was platformer dependence. Gamestop ripping off its customers??? Nooo! What a shocker!! Fine example of corporate greed! If I had that kind of money, this would be a solid package, actually. I wonder if any of that "VAT return" stuff applies and how much it could cut off. Financial examples regarding Nintendo are ridiculous...its more about, tell them to make a reason to buy it. The sony/xbox reasons are bang for the buck. Edit: sorry, i might have misunderstood...your example means Nintendo would have to lower their prices first? It's telling what people think of GameStop when the picture of Wario is the most popular thing on this article. Do some basic math, Nintendo Life. Keep in mind I'm not defending Gamestop, they should just sell the Switch by itself, but facts are facts. Nintendo should shift focus on the retail front.. open your own chain of stores like Apple. Let other retailers stock and sell your items but ffs.. make your own stores. It's the only way companies like GameStop will learn. It'll also raise the Nintendo brand. Still less expensive that what a Switch plus Zelda goes for in South America these days. @Barbiegurl777 Sounds like someone didn't take a good read at the article. The Switch is still $299.99, Gamestop is charging $599.99 for a big bundle that isn't just the system. @Mega_Yarn_Poochy Seems like something went very wrong with your addition. Might want to add the last bundle up again. GameStop always does this crap. Even down to the nitty gritty, bundling those Yellow Pokémon New 3DS XL with a charger, bundling amiibo together, this is GameStop being GameStop. And it's why I don't buy there. Besides, why would ANYONE buy at GameStop when $30 can get you 2 full years of 20% off All New Games at BestBuy with their GCU membership? Even amiibo get the discount. The only time I touch GameStop is for their exclusives, like Has Been Heroes physical release for Switch, or Ultimate Marvel vs Capcom 3 for Xbox One. @Roam85 Do Wario games sell poorly because they are low budget and Nintendo doesn't put their best teams on them or simply because Wario doesn't have selling potential? @Equinox Nintendo store UK - offer a 2 year Warranty if you buy from them online..
GameStop should be shut down. Does anyone shop there? Actually picked up my Switch from Walmart and it went amazingly well. @roboshort : It's a catch-22 as Wario games tend to have a lower budget due to the fact that they are not expected to sell in high numbers. Perhaps the most ambitious entry in the franchise was the 3D platformer Wario World on Gamecube, which struggled to sell half a million copies worldwide. As much as I'd love to a see a new 3D platformer with a more modern aesthetic, it seems very, very unlikely, unless Wario's popularity suddenly explodes sometime in the coming years. I'm more interested in the WarioWare franchise though, considering that it does what no other brand does. Smooth Moves was absolutely brilliant, and other entries in the series, such as Touched! and Twisted! were also fantastic. I've also poured many hours into WarioWare: D.I.Y. and made some pretty neat games for it. I'd love to see new WarioWare games on 3DS and Switch, but if we could only have one or the other, then I would definitely prefer one on Switch. Hell, I'd even settle for a port or a "deluxe edition" of Smooth Moves. I think they can pull off a lot of neat things with the Joy-Cons and the HD rumble feature. The only question is whether they will make it happen, and I really hope they do. @Tarvaax Should be fixed now. $600 and not even a Pro Controller is bundled? Boo, I say! At least put that in instead of Just Dance and the Zelda DLC. We need a new Wario Land! This is ridiculous. Given that the console is so scarce, Nintendo has the leverage to say you sell it without strings attached or we'll ship it to another retailer. I've spent way more than that on my Switch but I got more stuff. Thank you prime discount! Surely things like the ac adapter are already in the box?! 365games sold out of Switch then offered just the console a day later for £309 then a day later it went up to £329. My Local CEX game store had a Switch on display in their window for £350! A few days ago the Neon Red/Blue Switch came into stock on the Nintendo Official UK Store, grabbed it then hours later it had sold out, it's now been sold out all week. Best place to grab a Switch though for that 2 year warranty and no silly inflated prices! The demand in the US must be truly great. Without region lock just get one from Europe/UK. Still be cheaper. On UK Ebay a workmate got one BNIB for £350 with Zelda. If you don't believe that a large amount of scalpers bought Switches you are not being realistic. Ebay EU is full of Switches at far better deals than ripoff Gamestop. In UK Buy It Now prices range from £325 up the £700 LoL. Many BNIB. If you throw in postage it may still work out cheaper. I DO NOT usually support scalpers but what Gamestop is doing is far worst. The are suppose to be a "proper business" but are making the scalpers look like the good guys. @ThePoochyKid I'm glad someone else already posted this. Because yeah, this definitely isn't a markup, or at least not a significant one. It might actually be a (very small) savings on both bundles. I like this site, but I think they're a bit off with this one. Forget that! Light Speed's too slow. Yes. Colonel Sanders, prepare this ship for... Ludicrous Speed! Time is on my side Gamestop. What a joke. If I paid more, would they not make me buy Just Dance? This isn't surprising, especially from the likes of Gamestop. You'd trade in your own soul and all you'd get would probably be $20 dollars worth of store credit. I stopped shopping at Gamestop ages ago. I sell all my games on EBay and buy my games at Amazon (20% off preorders with Prime) or Best Buy. Amazon even gives you 20% off amiibos on preorder. Gamestop is cashing in on a popular product. I honestly don't blame them, but I use my right as a customer to shop elsewhere! I actually went into a Gamestop today because on their website, it simply says, "Order from our next shipment in-store today. While supplies last!" Then when I got there, I found out that you had to get the entire bundle and not just the console. Umm...I wish I knew that before wasted my time going into their store. I was telling my girlfriend that GameStop will GameStop and that why I want to get away from them. She got me a powerup card for my bday, so I shop there and use it but I told her that when it's expired I'm out. If you play the system, you can get a decent deal. I only turn on a game I'm done with when there is a special to get like double credit towards a game I'm buying anyway, and I have no complaints. But stuff like this is why I think GameStop is bad for gaming. They really prey on the masses that are uninformed. Some mom will come in wanting a Switch and they will push this bundle, which hey won't buy. They will go to their friends and say how the Switch costs so much, which will spread like wildfire. I have watched GameStop sell used games that cost $20 more than the new game that's on sale that week, with the sentence" the used copy is a savings" when it literally is not because of the sale that the customer isn't aware of. How I miss having multiple game stores. As a kid part of he fun was going from bandages, to EB, to mom and pop shops and seeing what I could find. Five hundred and ninety-nine US dollars! There are complaints that customers have placed an order with GamesStop a least a week ago (when their site said that they still had some in stock). Then these customers are told that, first their payment failed (which wasn't true for a lot of customers) then, they are told there are none in stock. Then they come out with these bundles!?! Oh wow, a 64gb sd card. So large. So nice. I'm just glad I found a Pro Controller in the wild today. I'm all set until Mario Kart now. Given how awesome Wario is I still can't believe he doesn't have a Switch icon or ten. Can a Switch Wario Ware be far away? Just import from the 5 European Amazons (UK, FR, ES, FR and IT). Note that the prices listed have 20-22% tax on it so for US buyers, you'll pay without the tax (cheaper). The shipping is where it makes up for it though. Also your US Amazon login will work on any European Amazon so just login in there and use Google translate. A friend imported BotW LE an Amazon.it and paid only $103 including shipping. I asked him to try and order (but not confirm) a Nintendo Switch as well (listed 330 euros) and it came up around 330 USD including shipping. I believe Amazon France stop accepting orders outside France for some time now, but I was able to preorder earlier in January. @sillygostly I always thought a Wario/Waluigi 2D platformer where you could switch between the two would have gone down quite nicely on 3DS, maybe as an eShop game. I also think adding Waluigi would have freshened the series up a bit, if that's what they were worried about, and would also have given Waluigi his first game!! @Mogster I always wanted a Paper Luigi game and a Super Wario Bros game. @MrYuzhai I had the same thought just the other day but ultimately wouldn't work financially. You'd have to pay for the store, upkeep, additional staff. Not to mention as a primarily gaming device there isn't a whole lot they can market in such a store. First party games? How many? Third-party? Customers would likely just go in, look at the price and likely decide to go somewhere else ro something. Not to mention what other hardware items are they going to showcase? Apple as a family of products while Nintendo, as far as we know, has only the Switch. Probably why they briefly went with the mobile Switch demo with that John Cena guy and other celebrities. @BraveSonic I would actually love to see anything related to Wario Land/World for Switch, or at least 3DS. WarioWare is all fine and dandy, but I need some more platforming puzzles and coin grabbin' action with my favourite plump anti-hero in my life. I'm not really sure why everyone is being so hard on these bundles. For one its not a mark up on the value in them. For another point you are gaurenteed a Switch from the next shipments, and it is sent directly to your house (yes, I got the $600 bundle because EVERY store locally sold out in about an hour that morning). Another thing I was told is that you can bring any part in and trade in for equivalent value (like the grey joycons for colored...Just Dance for a different game...etc). However I will probably keep Just Dance because because I have twin 14yo daughters who are excited to get it. With no stores able to tell (at least around here) when new shipments of Switch will he coming in...nor any idea if I'd e able to get one then or be stuck at work AGAIN when they do...this to me was a grat alternative to gaurentee my family a Switch. To my American friends, please do not support this company and shady methods like this to make money from you. Buy a standard midel once they come into stock, more than likely before the April 16th date. @Highlar The point of contention is the fact they are saying buying just a switch is catagorically out of stock, yet if you buy the bundle? Sure! We can get that for you! Give us your money! Which totals to $610. That would make the bundle a $10 savings over buying each of these items individually. I'm not 100% sure if that's "ludicrous." Personally I could do without some of the items (Just Dance, the BOTW guide) but I've seen enough regular folks try to sell the system alone (with no games, or literally anything extra) for the same price as this bundle to know this bundle isn't exactly the end of the world. Not really. I talked to them about this specifically. This is a del between Nintendo and Gamestop. The retailer IS out of stock. The units in these bundles come from Nintendo through Gamestop. Basically it ensures you get a Switch from the next shipment. The 509.99 one isn't too bad, that actually has pretty much what I bought, minus the extra joy cons. If that's what all you want its not bad. But gamestop is really doing this because they think this is what people want with the system, or so they say. (Funny they shut their user reviews off prior to launch) This also seems like a real cash grab off people who feel like they need one. Plus dealing with gamestop is a headache. @Highlar So basically, a post launch shipment preorder on a standard model, indirectly offered by Nintendo through a third party, with extra things thrown in to beef up the initial price point... Sounds incredibly shady to me. Lul, this is great. The people crying about this poop should try moving to Europe. Sorry that you gotta pay $600 for what we would need to pay $660 for, from a CHEAP retailer. At a EU Gamestop? Probably $750. Other than that, geez Nintendo, move some stock to the US, this is pathetic xD I could waltz right into my local supermarket and buy a Switch this instant if I wanted to. Heck, even the local ice cream guy has one on display that you can buy. I'm not kidding. Dang, man, what crawled into your Cheerios and died? "it's capitalism at work and we should just deal with it"
Ahh, Gamestop. The only official retailer that's also their own scalper! If I pay $35 more for the bundle preorder can they NOT include Just Dance 2017? Gamestop is a magical, amazing retailer. Unlike normal retailers, who bundle products together and makes you pay less for them, Gamestop lets you pay extra for the privilege of buying in bulk. You can even sell your game to them for $3, and but it back for just $40. I made a comment to my local Gamestop manager that they're basically becoming scalpers themselves. I just do not get some of the comments. How is this shady? It is nt making people pay any kind of premium prices on anything. Its the sme price or a little less to buy them all separately. You don't want them and want to wait? Then ait and ake your chances. No retailer that I knows does preorders on anything other than first ships. After tat you are on your own to try and get it. I couldn't prerder te Switch (no funds at the time) and ad o work through te entire launch weekend. This s a retailer bsically offerin a second preorder for people. Granted you have to get it in bundle form, but it stll gaurentees you the product you want. If you don't want it, then you don't have to get it. That seems pretty simple to me. But to those trying to claim scalping or gouging customers...come on now. It would only be that if they were overcharging on what is IN the bundle to make an extra profit...and they are not. The ones doing that are those on Ebay...Amazon...etc...trying to charge $500-600 for the system alone! @MisterSmith I don't quite see where people aren't getting this. Its almost like some posts are just bashing Gamestop because...Gamestop. Its not stealing from customers or paying premium prices on anything. @Highlar Gamestop infamously does this with hard to stock (read: Nintendo) items. They started doing it back during the Wii era. They pre-allocate a portion of their inventory of hard to stock highly demanded consoles to these bundles. I/E, they get 50,000 Switches in, and 2,000 of them are reserved for the various markup bundles. They know that the individually sold units will sell fast, so that what is left to sell when customers come looking for a Switch is units that are only available in the bundles. They may not be marking the prices up, but they're holding inventory back and saying "if you want this highly in demand hard to find item, we'll sell you one, BUT you have to buy these half dozen other things from us too." It's definitely a questionable practice. Not illegal, and clearly not a violation of their contract with Nintendo, but it's not wrong for consumers to identify it as a bad deal and a bad faith program. @rallydefault - Go easy on him. I'm positive @ironside1911 is 12 and thinks he's funny even though his posts are witless and void of comedy. He'll probably get grounded from the internet soon and forget he used to embarrass himself on this site. @Equinox yes that is what I meant. Thanks for the info. You can buy those bundles from GameStop and then return the individual items. We got a Switch this way and returned the extras we didn't want. @MisterSmith This practice of "Bundling" ensures a higher profit per customer - or per "switch" In this instance - a sale of 1 Switch console -their profit would double - basically because you may end up buying stuff you don't really want - just to get the switch. . .
You know that a launch is going well when people are trading rumors on which stores are supposed to be getting more units in stock. I know someone who is headed to our local Toys'R'Us today because a clerk told him that they will be getting some Switches in. He did not pre-order because he was not certain if he wanted it just yet. The reviews for Zelda BOTW changed his mind. He has decided that he needs to play that game ASAP. This isn't necessary a mark up if you were to buy all the items individually, but it's the fact that they are forcing stuff upon you that you may not want, such as the guide and especially Just Dance 2017. That alone makes this "bundle" ridiculous.